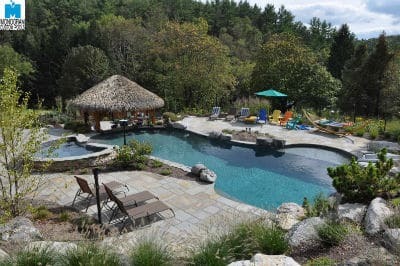 We have been named one of the Top 50 swimming pool builders in the United States and the #1 in ground swimming pool builder in the Lehigh Valley and Pennsylvania. 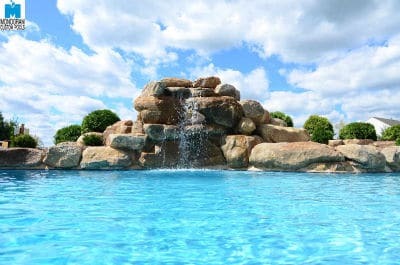 We've also been voted Lehigh Valley's Best and Favorite pool builder 5 times! We know that any in ground concrete swimming pool design (salt water or chlorine), no matter how big or small, shouldn't be built without also building a lasting relationship with the customer. 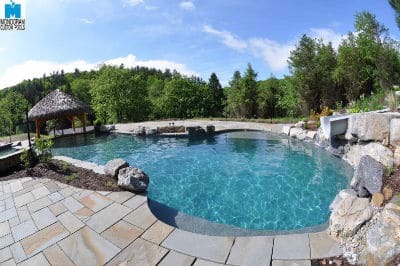 The foundation of that relationship is our simple but profound commitment to providing a positive pool building experience, centered on a complete dedication to your pool building project. This is the reason our construction contracts end with the phrase, "Signed in the spirit of friendliness and neighborliness." We are proud of the fact that so many of our pool and home customers become repeat customers and that 95% of our business is from referrals. We would love the chance to show you how we can build you a swimming pool that requires virtually NO MAINTENANCE, adjusts pH and chlorine automatically, sparkles like no other pool you have ever seen, can be controlled from your iPhone ® and is remotely monitored by the Monogram Custom Pools office. We are the ONLY pool builder to ever receive the Better Business Bureau's award for ®Excellence in Customer Service." 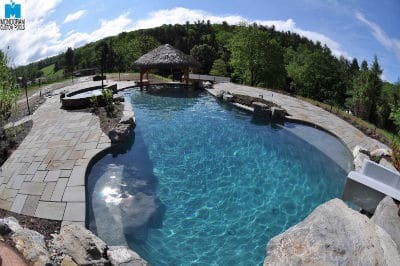 Please call or email us to discuss your in ground concrete swimming pool project and let us show you why we are the #1 swimming pool builder in the Lehigh Valley. We design and build swimming pools with intelligence. We combine cutting edge technology with state of the art designs to create the most energy efficient, award winning, hassle free swimming pools in existence. Collaboration is key to success. We will listen to your lifestyle desires for your "backyard oasis" and incorporate them into one of our award winning 3D pool designs which we will then upload to the web for you to review and share with friends and family. Building something beautiful is easy. Building something beautiful, functional and that doesn't require a lot of maintenance isn't. 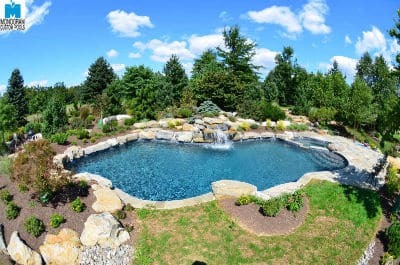 We've spent years engineering the "hassle free" pool to ensure that our pool designs require minimal maintenance, look beautiful, and require no handling of nasty chlorine, shock, or algaecide. Nobody builds a pool like Monogram. 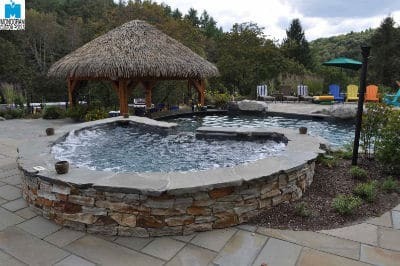 We exceed all industry standards and our pools are not only built to last, but they look great along the way. From our extra strong gunite shell, to our 25" rebar overlaps to our sweep 90 degree elbows...anywhere we can make a pool stronger and more energy efficient, we do. Check out our specifications page for more details. 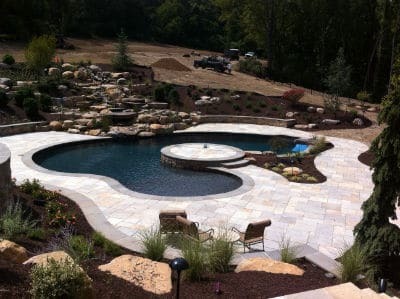 Our flawless customer service reputation is part of the reason Monogram is the #1 pool builder in Pennsylvania. 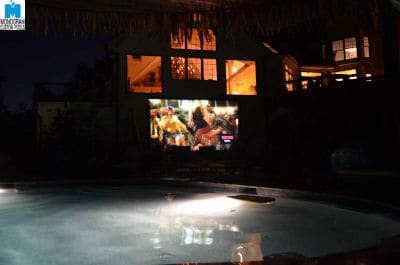 We've got "raving fans" as customers, countless glowing reviews all over the internet, and in our 20 years in business, we've built over 300 custom pools and homes for lots of amazing people who have since gone on to be some of our closest friends. We are a full service builder and handle ALL aspects of your pool construction. 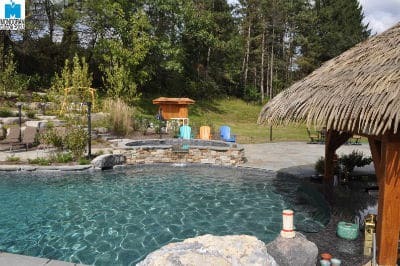 Many "pool only" builders force you to hire, pay for and manage your own electrician, gas connection, surveyor, fence install, and even water delivery. Not with Monogram. EVERYTHING is included. Even rock extraction if needed and lawn repair when the project is complete. Monogram is deeply rooted in the NorthEast PA area. 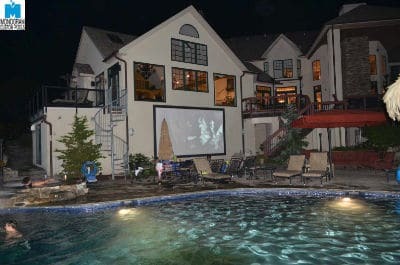 The owners are Lehigh University graduates and personally meet and work with every single pool customer. 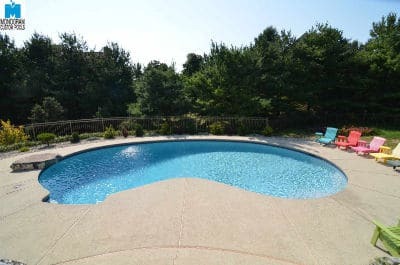 We are straight shooters and our customers enjoy the fact that their pool design, specs, and overall experience is handled by one of the owners. At Monogram, we believe that our 400+ happy customers are the reason for our continued success. Our employees (many of which have been with Monogram for over 15 years) know that their #1 goal is to exceed our customers expectations. And they know that they are empowered to do whatever it takes to achieve that goal. 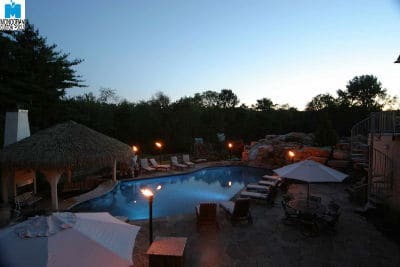 We realize that your pool is going to provide you with years of fun and happiness. We want the experience of building the pool to be just as much fun. 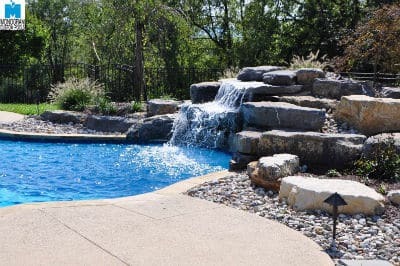 We don't "nickel and dime" you throughout the process, we trust our customers, and they trust us, and we help guide your through the color selection process to ensure that your pool turns out exactly how you dreamed. Our pools truly are "hassle free." Our Ultimate+ pool requires no manual handling of any nasty chemicals! You never have to manually add acid, shock, chlorine or algaecide. No more weekly tests or visits to the pool store either! You spend more time enjoying your pool rather than working on it. Whether it is a house or a pool, we build them in the most energy efficient ways possible. Variable speed pumps, sweep 90 degree elbows, full flow valves, extra pool return, over sized pipe, and a high flow filter combine to make our pools the most energy efficient possible. When we complete a pool, you get a personalized energy audit. Our pools average $23 per month for electricity. A "normal" pool with an old fashioned pool pump can be closer to $150 per month! Every single pool we have ever built is salt water and 75% of new pools built today in the USA are salt. You can't taste it, but you recognize that the pool isn't full of nasty chemicals. Some builders will give you nebulous reasons to not install salt because they want you to visit their store weekly to spend money on chemicals. Not Monogram. We want your pools to be hassle free! We realize that your pool is going to provide you with years of fun and happiness. We want the experience of building the pool to be just as much fun. 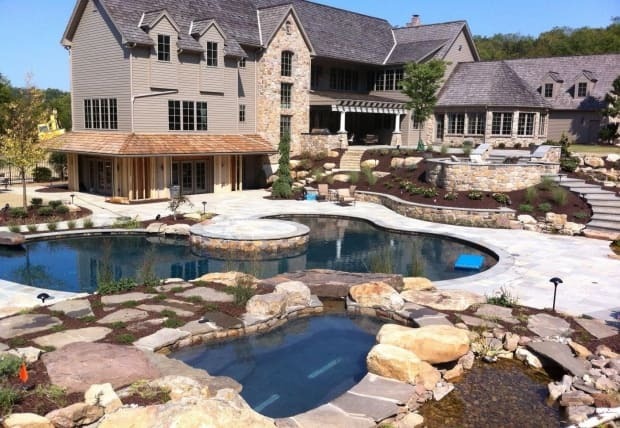 We don't "nickel and dime" you throughout the process, we trust our customers, and they trust us, and we help guide you through the color selection process to ensure that your pool turns out exactly how you dreamed. 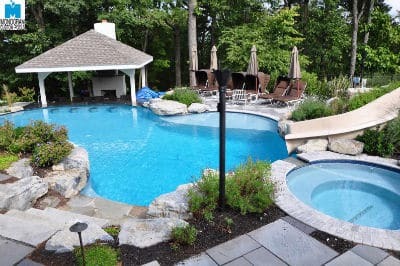 Some pool builders are single man operations and they struggle to manage their pool builds while attempting to meet new customers, taking customers to pools to see different colors, handling service and warranty work, etc etc. And then there are the massive companies that you become a number and don't even know the owner or get to meet with him. The personal touch is lost, and the pool building machine takes over. With Monogram, you work directly with the owner and are guided along by our employee specialist. We have a full support staff in place to help you with color choices, answer service questions, or explain your schedule. 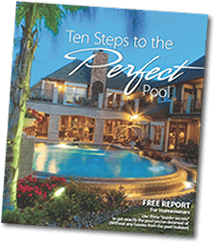 Monogram was just selected as one of the Top 50 Pool Builders in the USA! BIG NEWS! Monogram was just voted Lehigh Valley's BEST POOL BUILDER and BEST HOME BUILDER by the Morning Call readers! Monogram just received the Morning Call's "Best Builder" award for 2010! Monogram has received over 40 awards for professional excellence from the Lehigh Valley Builders’ Association including multiple awards for our outstanding swimming pool designs. Monogram is the ONLY company in this region of PA to win the Better Business Bureau’s highest honor, the Premier Award for “Excellence in Customer Service”. ENERGY EFFICIENT CONSTRUCTIONMonogram has received 5 awards for the most energy efficient construction projects in the Lehigh Valley. We incorporate this same energy efficient philosophy into the pools we build. In 19 years of operation, with hundreds of construction projects including homes, pools, outdoor kitchens, additions, commercial projects and even underground nightclubs, Monogram has always upheld a higher standard of customer service and 95% of our business is from referrals. And many are repeat customers. We are proud of our perfect record with the Better Business Bureau and the Lehigh Valley Builder’s Association. Before you build with ANY pool builder, make sure you do your research…both locally and through an internet search.